Sedum plants come in a wide variety of heights, colors, and forms. Showy Stonecrop, the taller plants in the genus Sedum, are popular garden plants that are extremely easy to grow. Although lovely, sedums are often taken for granted in the garden, partly because they don’t bloom until the fall, but also because they require so little care from the gardener. The thick leaves of these succulent plants are able to withstand both drought and rainy weather. The flower buds form early and remain attractive well in winter. If the deer didn’t eat them, Sedum would be a perfect plant. Growth Habit and Leaves: Border Stonecrops are a small section of the hundreds of species of Sedum. These taller growing Sedums have thick stems, fleshy leaves and tight flower heads that start out looking similar to heads of broccoli. Most are sturdy enough to stand upright on their own, with a few varieties that have a nice trailing quality, suitable for containers. 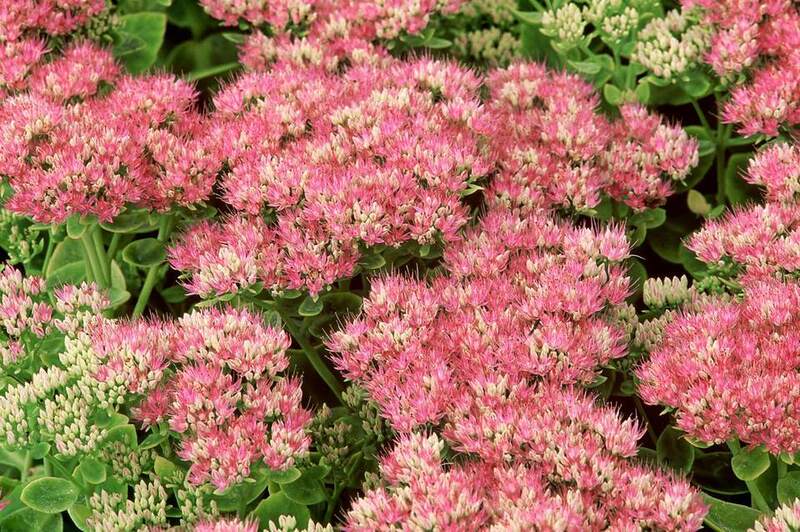 Flowers: Tall sedum flowers tend to come in shades of pink and mauve, that start out pale and deepen as they mature. The flower heads are attractive from bud through to their dried stage and are usually left standing tall throughout winter. The stems are even strong enough to hold a few inches of snow, capping the flower tops. Actual hardiness always has some variability, depending on the type of sedum you are growing and your growing conditions for the year. However, sedum plants tend to be tough and adaptable. You can expect them to survive in USDA Hardiness Zones 3 - 10. Most tall sedum varieties stand upright and form a well-behaved mound, but there are a few, like "Matrona" that naturally flop over. In general, expect the mature size of your sedum plants to be 6 - 24 inches (H) x 12 - 24 inches (W). Sedums will grow best in full sun. They are very drought tolerant, but stonecrops can get sun scald in extremely hot, dry conditions. Sedums can be grown successfully in partial shade, but the plants might not be as sturdy and upright as they would be in full sun. Although sedum flowers don't open until late summer / early fall, the flower heads form early in the season. They start off a green color, like a broccoli bud, and slowly change color, usually from a pink to a mauve. The earlier, paler color is actually the flower in bloom. The mauve color is generally when the flower head is starting to dry. But sedum flowers tend to look good in all their stages, making them a great plant for a long season of interest. Sedum look especially good in a small mass planting that takes center stage in autumn. Because they look good all season, sedums are suitable for edging, as specimen plants and in containers. Smaller varieties are good choices for rock gardens and walls. Sedums make long-lasting cut flowers and are great for attracting butterflies and other pollinators. Sedum "Autumn Joy" - Still a favorite because it is such a wonderful, beautiful performer. Sedum spectabile "Brilliant" - A clearer pink than most Sedum flowers. Sedum "Vera Jamison" - Burgandy leaves and mauve flowers with a trailing habit. Sedum "Black Jack" - Deep burgundy, almost black foliage and strong upright habit. Sedums are extremely easy to grow. They prefer a well-drained soil but can tolerate rainy weather as well. Extreme heat and lack of sun both cause Sedum to get a bit leggy. Pruning the plants back in early July will encourage them to get bushier and to grow sturdier, but it can result in smaller flowers. Most of the sedum seed offered is for the low growing, ground cover varieties, not tall sedum. Taller sedums tend to be hybrids, and they won't grow true from seed. You will usually need to start off with plants or divisions. Stonecrop flowers bloom only once; late in the season. Stonecrops do not need deadheading and often look good right through the winter. After several years, the center of Sedum plants will show signs of dying out, a sure sign they need dividing. Dividing them is a good idea at that point, to keep the plant vigorous. Stem cuttings can be taken at any time, to propagate more Sedum. Sedums are not the only easy to grow succulent plants for your garden, although they do tend to be hardier than most other succulents. If you are interested in growing more of these fascinating drought-tolerant plants others you might try include Aeonium, Agave, Crassula, Echeveria, Euphorbia, Ice Plants (Lampranthus), Kalanchoe, and Senecio. Many of these also make great houseplants. Lovely, but Stinking Hellebore. A Plant to Know and Grow.